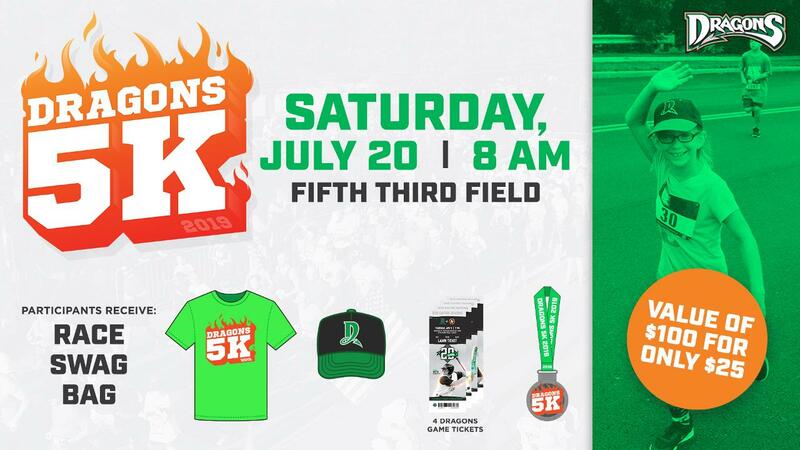 Dayton, Ohio-Registration is underway for the 9th annual Dragons 5K on Saturday, July 20, 2019 starting at 8am at Fifth Third Field. The event began in 2011 and has become a local tradition as one of the Miami Valley's largest races with over 2,000 runners and walkers participating annually. All participants in the race receive four (4) lawn tickets to a future Dragons game, Dragons 5K t-shirt, Dragons hat, NEW finisher's medal and entry to the post-race party inside Fifth Third Field. Additionally, if participants sign up for the race in the first 30 days (by March 2), they will receive a bonus of two (2) stadium seat tickets to a Dragons game in April/May. Participants may choose to run or walk the course and baby strollers are also permitted. The race will feature the same great family-friendly entertainment you see at every Dragons game, including Dragons mascots, Green Team, and Dragons Drumline! The race course will move through downtown Dayton and end back at Fifth Third Field for a post-race party. The post-race party inside Fifth Third Field is open to all participants and their family/friends. Activities include fruit and water for participants, inflatables, health and wellness booths, and more! The top three male and female finishers will receive a specially-engraved baseball bat. The top three male and female runners in each age group will be awarded a Dragons Den gift certificate. Also, top finishing groups and high school running groups will receive great group prizes with the grand prize being a luxury suite at a Dragons game. For more information on the Dragons 5K, go to http://www.daytondragons.com/dragons5k.